For three days in July 1972, U.S. military forces searched in vain for Air Force Captain James Huard, whose F4E Phantom disappeared over North Vietnam. The Dearborn, Michigan native's family and friends have been searching for the past 25 years. 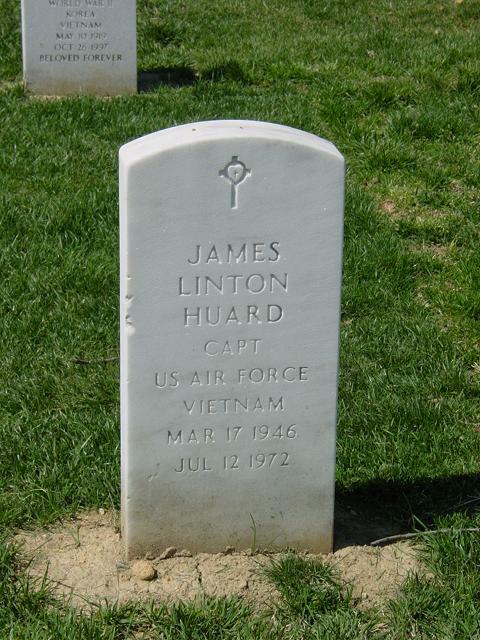 Thursday afternoon, their search ended and many of their questions and concerns were put to rest when Huard's remains were buried with full military honors at Arlington National Cemetery. "It doesn't seem like it's been so long ago," his widow, Cynthia Rogers, said as she clutched an American flag and seven spent shells that were fired during the 21-gun salute to honor Huard. "All of the emotions have been on hold. The emotions today are fresh." Rogers never got to say goodbye to her high school sweetheart. He was a junior at Central Michigan University when they started dating. She was a senior in high school. They were married, started a family and were preparing for the future. But their plans were altered forever that July day when Huard's plane disappeared about 7:30 a.m., some 17 miles northwest of Dong Hoi, North Vietnam. Cynthia continued to raise the couple's three boys -- the twins, Paul and Peter, and their younger brother, Daniel. Although the years passed and Cynthia remarried, she said she never forgot James Huard, the father of her boys. Jim was a great man, she said. He was devoted and committed to his family and to his country. With a quiet touch of his silver casket, Cynthia Rogers finally got to say goodbye to her first husband. "I think it's an honor to all Vietnam veterans to see one of their own buried like this," she said. "But we should never forget about the other soldiers who are still missing." Rogers sentiments were echoed by the members of Vietnam Veterans of America James L. Huard Chapter 267, who made the trip to Virginia from Dearborn. "What you witnessed here today was a chapter in a war that won't ever go away," said Colin McGee, one of the founders of the Dearborn Vietnam Veterans chapter. There was joy and closure among those who gathered Thursday, but it was tainted with the reminder that thousands of U.S. soldiers remain missing. "This is more important to us than anything," said Ted Gagacki, past president of the Dearborn VVA. "The burial is helping bring this all full circle." Huard was the 44th and the final Dearborn veteran to be returned to the United States. Of the 2,124 Americans who remain missing from the Vietnam war, 67 are from Michigan. Vietnamese government officials turned over 38 boxes of remains to the U.S. government in 1988. After six years of research and forensics testing, some of those remains were positively identified as Huard. They were turned over to the family January 29, 1997. In Dearborn, about 50 veterans gathered Thursday on a cold, windswept morning to honor "the good captain" and lower the POW-MIA flag that has flown at Dearborn High School awaiting his return. "This ends the Vietnam War for Dearborn, finally," said Paul Kane, 49, once a Navy third-class petty officer who served a tour in Vietnam and is now a lay minister at First Methodist Church in Wayne. "Today, the good captain comes home to rest." In Washington at the 11:15 a.m. memorial church service, Huard's brother, Neil, gave a eulogy that many were still talking about hours after the ceremony. "Some people are around forever and don't accomplish anything. My brother was around for a short time and accomplished very much," Neil Huard said. Neil Huard said what he remembered most were the times his brother spent "living, laughing and loving." Barely a minute after he finished his eulogy, sunlight pierced the chapel's stained glass windows, adding rays of color to the flag-draped silver casket. A few minutes later in the parking lot of the chapel, tourists passing by stopped to watch Huard's casket placed on a caisson -- a horse-drawn hearse. The honor guard and band stood at attention before turning on their heels to begin the mile march to Huard's burial plot. Fifteen minutes later, the procession reached the hillside burial site. As the sun shone on Huard's casket, four U.S. Air Force planes zoomed overhead. "Seeing my brother's casket and watching the flyover really hit me hard," Neil Huard said after the ceremony. Afterward, seven soldiers standing about 20 yards from Huard's casket fired three rounds each into the air. One minute after the 21-gun salute ended, a lone bugler standing under a huge oak tree payed tribute to Huard for his service to his country. Cynthia Rogers was presented with one flag from her late husband's casket, another was given to Huard's mother, 84-year-old Viola. As final prayers were said, Huard's casket was left alone to be lowered. Nearly 25 years after his plane disappeared thousands of miles from home, Captain James Huard is home again. "It was a very long time coming," Viola Huard said. "I missed him a lot."